Today marks the end of a 12 day vacation. 12 days!! No, we didn't get to spend the entire 12 days at Disney World or anything, but Ben didn't have to go to work, it didn't involve the hospital, and everyone got to sleep in a day or two. We also celebrated our 10 year anniversary :) THANK YOU to the Woods, the Gorins, and Kelly for watching Theodore so we could get out. And the Lecompte's for taking care of the dog and chickens a time or two :) And everyone else who was vital to our coordination in actually getting out of the house. Ben and I got a few nights ALONE and even got to take the kids on a midnight run to the beach. (Of course there will be pictures of that. You'll be able to find them everywhere per usual: The Fam tab, facebook, etc.) We met up with cousins there and had a blast. Theodore was left at home for all of it and I don't feel guilty in the slightest. Not in the slightest, and you can't make me. 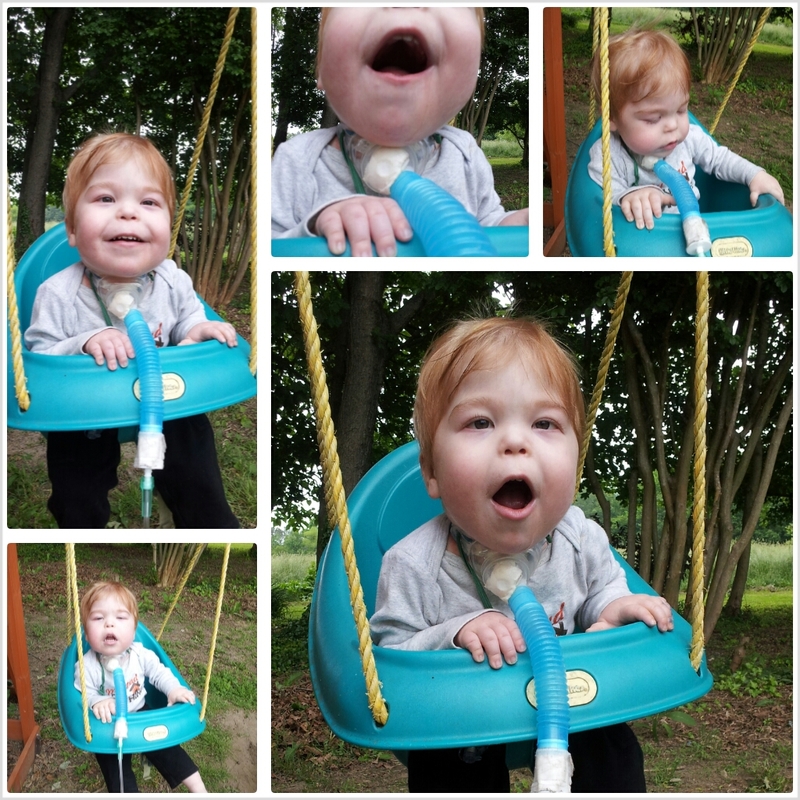 We did take him to a Memorial Day get together across the street where he experienced a swing for the first time. He wasn't so sure about it at first, but as you can see, he warmed up pretty quickly and spent a good amount of time in it. We are almost done school and hopefully things will slow down here a bit and I'll be able to give a little more attention to this blog. But for a quick update: currently Theodore is coughing and coughing and coughing. One day last week it was like a switch was flipped. He went from completely okay to fussy and yucky and we weren't sure what happened. Later that very day we got an alert that air quality was low. I'm not sure if those things are related but I would not be surprised. But on the bright side, a few days later his nurse left an open bottle filled with water (which we did not know) within reach and, yup, he reached it. He proceeded to spill it all over himself, including down his trach. Four to five hours of serious coughing and suctioning ensued. He still hasn't fully recovered from either event.